Bar t'at01943 608888work Public HouseThe name Bar t’at is an irreverent pun on a sacred phrase from Yorkshire’s anthem – ‘On Ilka Mooar Baht’at’. 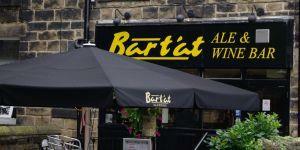 Bar T'at serves eight real ales from local breweries and a selection of continental beers. A good selection of wines by the bottle and glass are also available. Food is served daily and is freshly prepared on the premises (Bank Holiday times may change - please call to check). Bar T'at is well known for it's traditional homecooked food. The bar has no music, televisions or game machines and daily newspapers are provided. Freshly brewed coffees and other hot drinks are served all day every day. Bar T'at welcomes walkers. Dogs and walking boots accepted. The name Bar t’at is an irreverent pun on a sacred phrase from Yorkshire’s anthem – ‘On Ilka Mooar Baht’at’. Open 12:00 - 23:00 daily.